Grandiocosmic Strings, or G-Strings, are the conduits of all magic power in Erfworld and are disturbances on the plane of Zero. Only Thinkamancers, and Charlie, know of their existence. The majority of (if not all) Thinkamancy Spells are actually the Thinkamancer manipulating the G-Strings of the other Units. Strings can carry juice, from one entity to another. Adding juice to a string strengthens it. All known strings can be pulled in both directions. A unit's thoughts and experiences throughout the day cause knots to form in their g-strings. Sleep (specifically, dreaming) is the process of untangling said knots. G-strings intersect with H-strings, the strings that represent the bonds between units. The transmission of emotional data along H-strings reacts with G-strings and causes them to vibrate, giving Thinkamancers an indirect perception of H-strings as well. Wanda also believes that her fate and that of Jillian are tied together. This seems consistent with what Duncan Scone observed when he examined the two women with the Laurel of Napster. 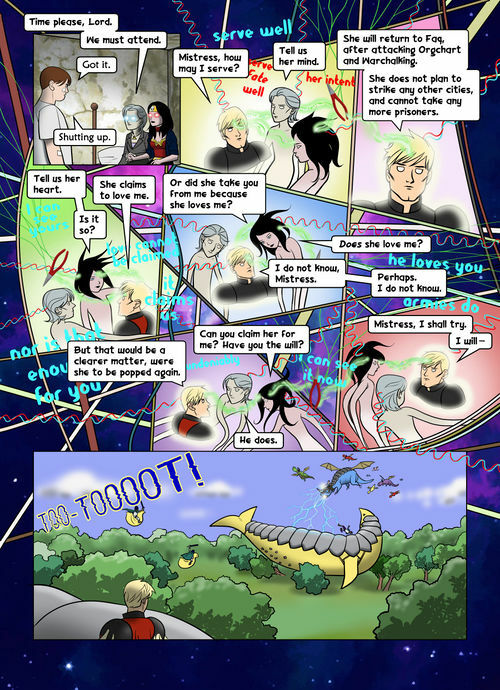 Strings appear to define and control every kind of relationship in Erfworld. A prisoner is bound by a string that connects prisoner to captor; if the string is severed (e.g. using the Arkenpliers), the prisoner is repatriated. A string (possibly Moneymancy-related) ties each unit to the side's capital, and is responsible for the unit's daily upkeep. Date-a-mancy connections in the form of strings exist between units who feel friendship or love for each other. Different types of strings appear as different colors in linkspace. According to Roger Victor Clarence, who has linked with a Carnymancer, strings may be "concretions of belief, the self existing as an idea of the self, Carnymancy as the application of juice to modify those ideas. What Thinkamancers believed to be constants of identify, Carnymancers perceived as mutable." Erf-b3-p249 The implications of this are not yet clear. A string which held the loincloth of Native Americans. A stringed instrument's specific string which is tuned to the musical "G" note. This could possibly tie in with the Titans being Elvis who was known to play a guitar. String theory - a similarly abstract theory of the underlying structures of Realworld physics. The entire notion and idea of each individual in Erfworld having strings that are the conduits of all magic power could also tie in with various mythology surrounding ideas that each life is a thread in a greater tapestry of the world which is manipulated or woven together by the people or gods themselves. Additionally, the concept of G-Strings bear some resemblence to the concept of Philote threads from Ender's Game universe by Orson Scott Card. This page was last edited on 24 March 2018, at 15:07.